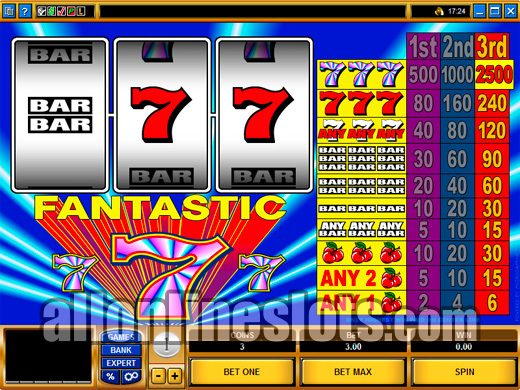 Fantastic 7 was one of the first slots to be released by Microgaming. It is a very simple classic slot with no wild symbol or multipliers. Maximum bet is three coins and teh top jackpot for lining the striped 7's is 2,500 coins. One of the original online slots, Fantastic 7's is a true to life classic slot game. It uses the three spinning reel, single line format and requires a three coin maximum bet to have access to the top level jackpots. As the name suggests, seven symbols are the key to the biggest pay offs. There are two types of seven symbol and three different winning combinations. The top jackpot of 2,500 coins is won by lining up three of the striped sevens. Second highest pay is 240 coins for three red sevens and finally any mix of striped and red sevens on the pay line wins 120 coins. Apart from the sevens you have the standard three reel slot symbols of the bars and cherries. Pays are also pretty straight forward with one for each of the matched bars, one for the mixed bars and a pay for one, two or three cherries. These wins range from 8 coins (1 Cherry) to 90 Coins (3 Triple Bars). Fantastic Sevens is available at all Microgaming powered online casinos. You can play it in a range of different coin sizes (25¢, 50¢, $1, $2 and $5) which can be changed without leaving the game. Simple press the up or down arrow located next to the coin size indicator. While Fantastic Sevens was a popular pick when it was first released it is starting to look a little dated. Having said that, if you are a die hard fan of straight classic slots then it is still worth a look.